Pictured in this photo from Friday, Jan. 5 are the remains of the herring brining shed of McCurdy's Smokehouse, sitting in Lubec Narrows. A piece of Down East fishing history sits stranded on a Canadian island and its American owners despaired Wednesday of rescuing it before scavengers finish tearing it apart. A nonprofit group has contractors ready to salvage the brining shed from the American historical landmark McCurdy’s Smokehouse in Lubec. The Jan. 4 blizzard tore the shed from its moorings in Lubec Narrows and it floated to Campobello Island. The shed is among five McCurdy’s buildings on the National Register of Historic Places. McCurdy’s has historic value as the last traditional smoked-herring facility in the United States. Lubec Landmarks, a 130-member nonprofit organization, has worked for almost 25 years to preserve the smokehouse. But Canadian officials aren’t allowing Lubec Landmarks’ contractors to proceed because of several legal tangles, including salvage rights claims by some Canadian citizens, said Lubec Landmarks president Rachel Rubeor. Lubec’s selectmen were due to hear from Rubeor at a meeting on Wednesday night, but town Administrator Renee Gray said the town will likely be unable to help Lubec Landmarks. “It is not a municipal problem until it is in the water and a navigation problem,” Gray said Wednesday. 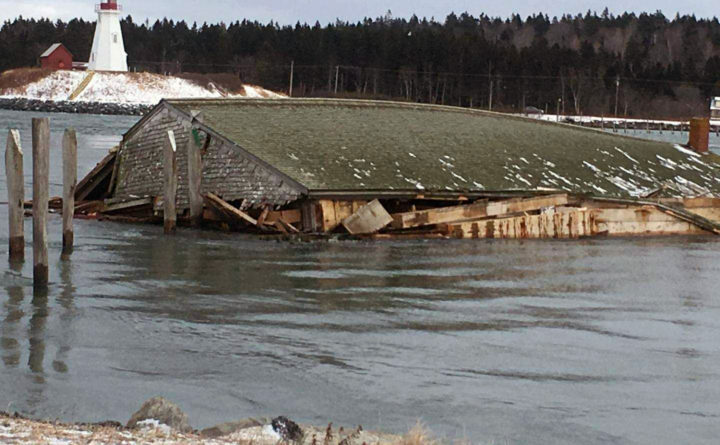 The shed’s remains, which include significant portions of its roof, flooring and fireplace plus some side walls, floated under the bridge between Lubec and the Canadian island in the Bay of Fundy last weekend. “It is just a miracle that it didn’t hit the bridge. It just sailed right through the pilings,” Gray said. Lubec Landmarks hopes to grab as much of the shed’s remains as possible for inclusion among McCurdy’s four remaining buildings, which are all up on pilings in American waters off the coast of Lubec. But the salvagers have already cut away portions of the shed with chainsaws, Rubeor said. About all Rubeor said she could do was record the Canadian license plates of the scavengers.